You can get your own "zombie preparedness" badge on the CDC website. 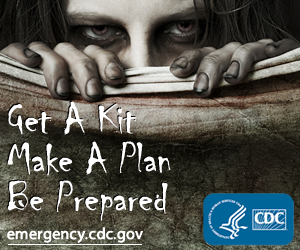 The Centers for Disease Control and Prevention (CDC) recently issued a guide on how to prepare for a zombie attack. That's right, the government agency put together a set of "emergency preparedness" tips for a "zombie apocalypse," an all-out mass infiltration of zombies. If you missed the article, you should probably go, right now, read it and bone up on what you need to do to protect yourself, friends, and family from crowds of rotting, brain-hungry, walking dead. As you review the suggestions for preparing for a zombie attack, take some notes. Go ahead, put them in your lab notebook so you will know where they are if and/when the time comes and you need to do a hasty review. (It is vampires, by the way, that are said to be repelled by garlic. Garlic may or may not have an effect on zombies.) Once you're done filling your brain (zombie delicacy that it is) with zombie facts and emergency preparation suggestions, head back here to finish up. We'll wait. Okay, now that you know what to do in the even that zombies come meandering down your street, arms outstretched, collective monotone cries of "brains" or "feed me" filling the air, make another note at the top of the notes you took. In your best zombified handwriting, write: Also for Pandemics and Natural Disasters. That's right. The preparedness strategies you need in the event something in the doughnuts from the local bakery goes to everyone's brains and causes rampant zombification mutation are some of the same strategies you need in the event of natural disasters, mass illnesses or viral outbreak, or other widespread epidemics or threats. All of this extra awareness of how to avoid, evade, and survive a zombie attack is especially helpful this week because May 22-28 is National Hurricane Preparedness week. The 6-month hurricane season along the Atlantic Basin begins June 1. Scientists are predicting that the 2011 season will be a particularly bad one, so FEMA and the National Oceanic and Atmospheric Administration are working hard to raise awareness and encourage people to be proactive in preparing ahead of time—before the winds and storms hit. Knowing what you now know about getting ready for a zombie attack (including what you should have on hand and what plans should be in place), you are hopefully in better shape to help your family, friends, and community get ready for the coming hurricane season, too. Hurricanes and Climate: Are there connections between global warming and the strength and frequency of hurricanes? Do Warmer Seas Make Stronger Hurricanes? Review historical data to explore the relationship between ocean temperature and hurricanes. Do Hurricanes Cool the Ocean? : What happens to the temperature of the ocean after a hurricane? You might also find some useful information in our previous post on Campground Science. As our lead staff scientist pointed out when I asked her about zombie attacks, in the wake of a zombie apocalypse, survival may depend on some solid camping-savvy skills. And, eventually, you might want a hot shower if you can find enough clean water. Luckily, camp science can help you with the water situation—and with s'mores! Zombies on the horizon or not, if you are interested in thinking through how to help plan either before or after an emergency, you may want to learn more about careers in Emergency Management.